The Irish Hospice Foundation has warmly welcomed a new framework which informs the development of Irish adult palliative care services for the next 3 years. The aim is to ensure a seamless care pathway across inpatient, homecare, nursing home, acute hospital and day care services. It recommends that specialist palliative care services should be available to all patients in need, wherever they are, and whatever their disease. Proposes targeted investment to develop service provision over 3 year timeframe and align service levels as recommended in the ‘Report of the National Advisory Committee on Palliative Care’ (2001). Irish Hospice Foundation CEO Sharon Foley welcomed the new framework and is looking forward to working in unison with all bodies to ensure specialist palliative care services is available to all patients in need, wherever they are, and whatever their disease. The HSE has launched ‘Palliative Care Services Three Year Development Framework – 2017 to 2019’. The Framework informs the development of adult palliative care services, both generalist and specialist, in Ireland for the three-year period from 2017 – 2019. Its aim is to ensure a seamless care pathway across inpatient, homecare, nursing home, acute hospital and day care services. Palliative care is an active and total approach to care from the point of diagnosis through to death and beyond. It embraces the physical, emotional, social and spiritual elements of care and engages with patients and families as equal decision makers in that care. The Framework being launched today aims to enhance palliative care service delivery in both community and acute hospital services, with a major focus being placed at all times on the delivery of quality person-centred, safe care for patients and their families. Welcoming the publication, John Hennessy, HSE National Director for Primary Care said, “The focus of the Framework was to identify the gaps that exist in the current level of service provision and to present a set of recommendations and actions which over the duration of the Framework (and at times beyond) would seek to address these service issues / deficits, subject to available resources. The Framework looks at palliative care service delivery in both community and acute hospital services, with a major focus being placed at all times on the delivery of quality person-centred, safe care for patients and their families. 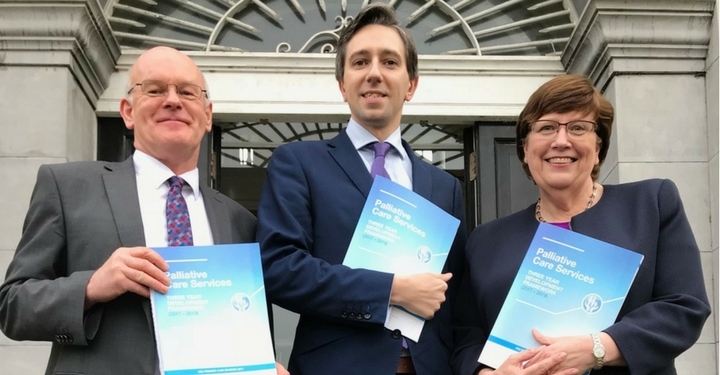 Sheilagh Reaper-Reynolds, HSE National Lead for Palliative Care said, “This framework captures the core issues that face us in improving palliative care services for people living with life limiting illnesses and their families. Focused consultation took place with many key stakeholders, including service user representative bodies and organisations, healthcare staff and management. This feedback enables us to plan together the development of palliative care services in a much more effective way that is going to meet the needs of our changing population”. The Framework recommends that specialist palliative care services should be available to all patients in need, wherever they are and whatever their disease. It highlights that there are still areas of the country without an inpatient unit, most notably in the Midlands, the South East, and the North East. Other areas do not have the recommended bed complement and/or the recommended staffing levels. In addressing these shortcomings, the Framework sets out recommendations to ensure that by 2021, there will be equitable access to specialist inpatient palliative care services throughout the country. It notes that full access to palliative care services for patients with non-malignant disease is now the norm in the sector, with service providers accepting referrals based on need rather than condition. While the work of making palliative care available to patients with non-cancer conditions must continue, attention should now also extend to the needs of vulnerable populations such as people with disabilities, migrants, and prisoners. The Framework states that by investing in properly resourced community services to care for patients with both malignant and non-malignant diseases, particularly in the last three months of life, this leads to reduced inappropriate hospital admissions, more appropriate care pathways and improved experience for patients and their families. The Framework complements and builds on the government’s palliative care services policy document ‘Report of the National Advisory Committee on Palliative Care’, published in 2001. It proposes targeted investment to develop palliative care service provision over its timeframe and align service levels with those recommended in the 2001 Report.